When we burn fossil fuels, extract metals from ores, or make gasoline from oil, sulfur in the raw materials combines with oxygen in the atmosphere and produces sulfur dioxide. When volcanoes erupt, they also release huge amounts of the gas. 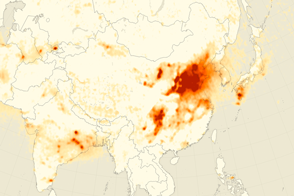 Sulfur dioxide causes acid rain, and it contributes to smog. It also leads to the formation of light-reflecting sulfate particles, which cool the climate. 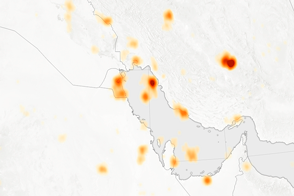 NASA sensors, such as the Ozone Monitoring Instrument (OMI) on the Aura satellite, provide daily global maps of sulfur dioxide. 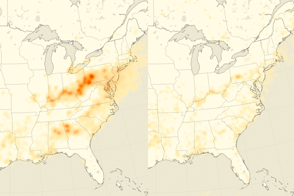 These maps provide valuable input for air quality models, for assessing the impact of emissions on ecosystems, and for climate prediction models. The top image in this pair shows measurements of sulfur dioxide in the air over one of the largest power plants in eastern Europe, the Maritsa Iztok Complex in Bulgaria, on January 12, 2009. 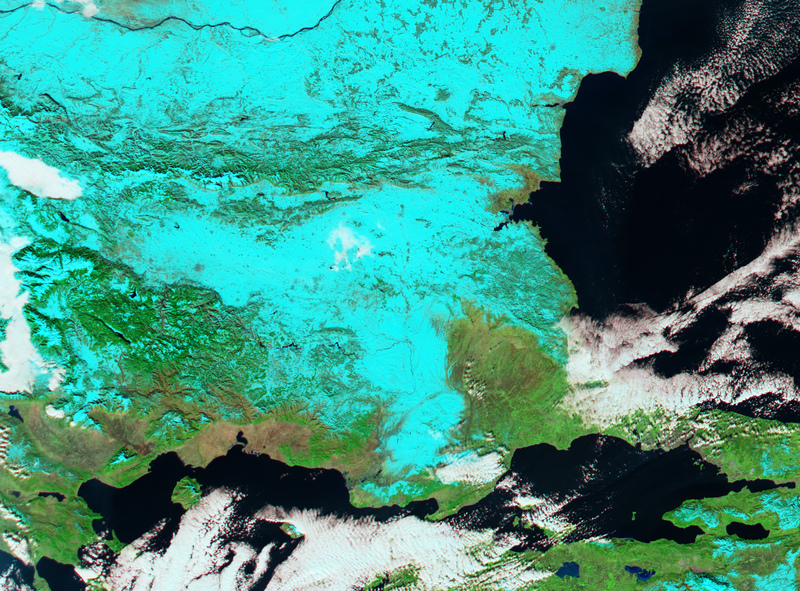 The false-color image below is from the Moderate Resolution Imaging Spectroradiometer (MODIS) on NASA’s Aqua satellite that same day. It uses visible and infrared light to distinguish clouds and exhaust plumes (white) from snow on the ground (bright blue). 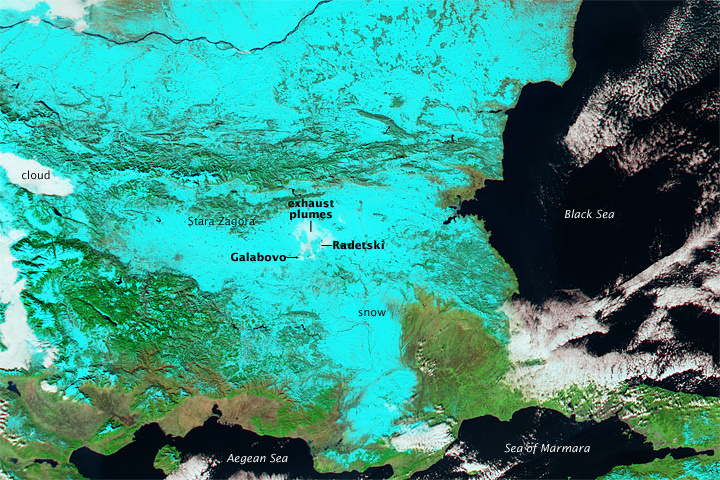 The highest sulfur dioxide concentrations detected by OMI appear in the air directly over two of the complex’s large coal-burning power plants, one near the town of Galabovo and one near the village of Radetski. 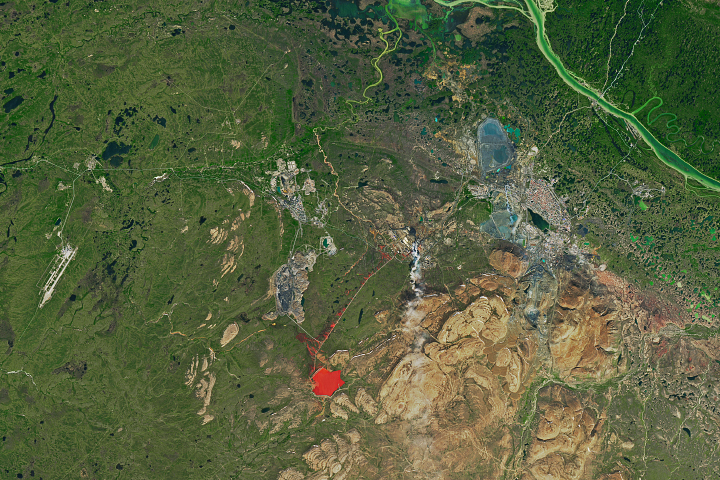 Sulfur dioxide in three “blocks” of the image (each block is about 24 by 13 kilometers) reached values of 3 Dobson Units (red). These values correspond to the location of the emission plumes that are visible in the false-color image. If you could compress all of the sulfur dioxide in a column of the atmosphere into a single layer at the Earth’s surface at a temperature of 0 degrees Celsius, one Dobson Unit would be 0.01 millimeters thick. While this may seem small compared to the amount released during some volcanic eruptions, emissions from power plants and other human sources are an “all day, every day” occurrence. Even with the sulfur dioxide emissions from continuously erupting volcanoes, such as those in Hawaii, human sources of sulfur dioxide far exceed natural sources. NASA images by Jesse Allen, based by OMI data provided courtesy of Nickolay Krotkov, NASA/GSFC OMI Sulfur Dioxide Group, and Aqua MODIS data provided courtesy of the MODIS Rapid Response team. Caption by Rebecca Lindsey. 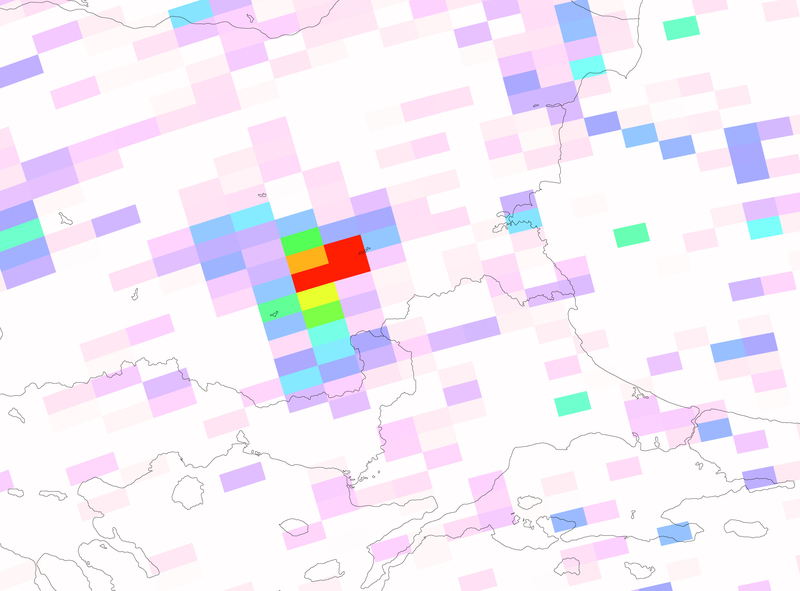 This image shows measurements of sulfur dioxide in the air over one of the largest power plants in eastern Europe, the Maritsa Iztok Complex in Bulgaria, on January 12, 2009. Lucas, D., and Akimoto, H. (2007). Contributions of anthropogenic and natural sources of sulfur to SO2, H2SO4 and nanoparticle formation. Atmospheric Chemistry and Physics Discussion, 7, 7679-7721. Accessed January 26, 2009. Wikipedia. (2008). Maritsa Iztok Complex. Accessed January 26, 2009.